There’s nothing quite like marble floors. They are easily the most elegant and luxurious flooring option and they make any place look more prestigious. However, there’s one thing a lot of people find out too late; marble floors need to be maintained properly or they end up losing their luster. Marble floors will look great for a long, long time if you maintain them properly. They will start looking dull if you treat them like any other floors. We have collected 6 tips that will ensure that your marble floors look amazing for many years to come. The easiest way to damage your marble floors permanently is to scrub them roughly. Most other floors can sustain rougher treatment so scrubbing doesn’t hurt them. However, the same isn’t true for marble. Marble has a shine on the top layer and if you scrub it too much, the layer comes off. 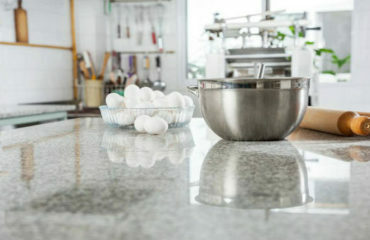 That is why it is always recommended that you only use a soft mop or a professional, commercial-grade machine on marble. Marble is very smooth; things don’t get stuck in ‘between’ marble so there’s nothing to scrub out. If you decide that you rather use a professional machine, here is a detailed guide that explains how to select the right floor cleaning machine for marble. Marble doesn’t absorb liquids but there are certainly some chemicals which can leave a permanent stain if left on the marble for too long. If you drop some coffee, soda, or any liquid on a marble floor, just clean it as soon as you can. If you clean up the spill quickly, it won’t leave any lasting damage. If your marble floors are already old, then the solution is to get them polished. You will be surprised at how great marble flooring looks after being polished. Over time, the polish that is done when the flooring is installed erodes. Polishing the marble brings the shine back. If you see a spot or a stain, don’t just use the mop to clean the whole area. 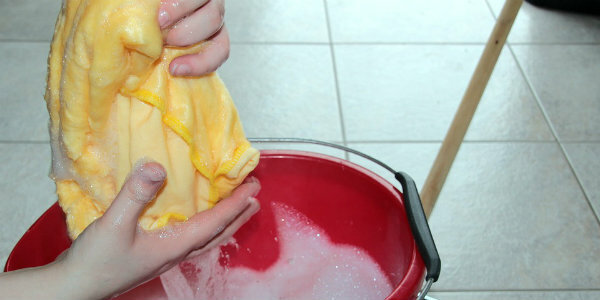 A much better approach is to sit down, take a soft cloth, and gently rub the area with a mild cleaner. Do not use a strong cleaning agent; it may end up ruining the polish and will make the marble look dull. If you try to clean the whole area where the spot is, you will end up over-cleaning the rest of the marble or you will end up leaving the spot intact. Most people don’t know this, but if you clean marble floors in a circular motion, you end up damaging it and make it look dull. Clean in gentle, straight lines. If you want to make the marble look great for a long time without requiring much maintenance, simply get a sealer. Sealers are a layer of transparent flooring above your marble. They are called ‘sealers’ because they seal the marble in and don’t let any liquid stain them. Maintaining marble floors is easy. The only problem is that if you maintain them the same way as normal floors, they will end up losing their beauty. Keep these tips in mind and your floors will look great for a long time. For more tips and advice about your marble or granite floors, feel free always to visit our website. In case you are planning a renovation project for your home or business, feel free to contact us. Since we’re the only direct importers of authentic Italian marble and granite, you’ll receive the best possible prices for the materials. Physically we’re located in Houston, Texas, but we ship throughout the country. We carry genuine Italian marble and granite for kitchen and bathroom countertops, floor tile and wall tile. So, regardless of the project you are planning, we’ll be able to find the right stone for you. About the Author: Quick Response Janitorial Services is a leading janitorial company in Houston and its surrounding areas. They help businesses maintain their commercial facilities clean and tidy. To learn more about them, visit their website at quickresponsejanitorial.com.